‘Biblical Expose’s of the Manhattan Declaration‘ – This is an ecumenical document uniting Roman Catholics, Eastern Orthodox, evangelicals, Mormons, etc. See leaders who signed Sept. 28, 2009. 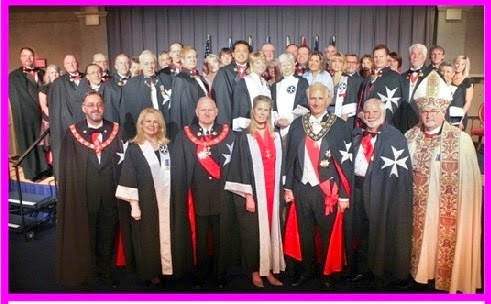 There is a dispute that the Catholic Knights of Malta (SMOM) under the Vatican and the Masonic Ecumenical Knights of Malta are not the same one, but that’s is what they want people to believe. 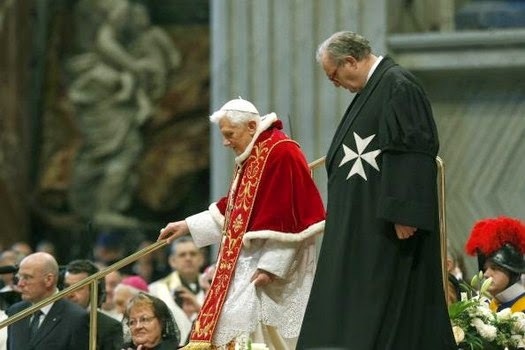 Either way, they both come from the same historical roots (Catholic Crusaders), both recognize themselves as ecumenical, use the same symbols and both have Catholic members, Catholic bishops as leaders & Catholic representatives in their ceremonies. You can see the letters from two popes Benedict (it says blessing was requested) & John Paul II, giving them their blessings to the Order of Malta,( go to activities, then correspondence). The Catholic Prince of Spain, Enrique Borbon was a Royal protector of the Order. The Knights Templar (33o) & Knights of Malta are the highest 2 levels of Masonic Rite of York (American), compare picture with stairs of Headquarters . Google map, street view. (Leaders are on first row). Pastor Rick Joyner, pastor Mahesh Chavda, prophet Bobby Conner & others were knighted same day. Jerry Boykin and prophet Paul Cain were also knighted but on a different date. 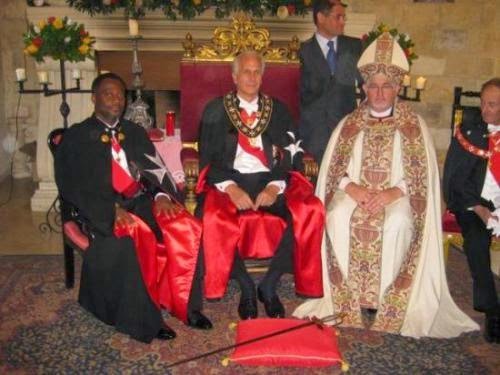 (L-R), King Adamtey I of Ghana (Dr. Kingsley Fletcher); Baron Nicholas Papanicoalou; and Archbishop Gregory Holley, members of the Ecumenical Order of St. John of Jerusalem, Knights of Malta. 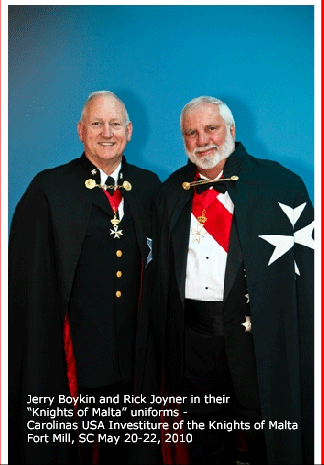 On Rick Joyner’s website he admits he is a Knight of Malta, in a video presentation he says he joined the order over 20 years ago, but he said is not a secret society but it’s an open group, there he talks about Mike Bickle, Mahesh Chavda and others being knighted with him. He founded the Oak Initiative with Boykin, Freemason N. Papanicolaou & some others as leaders of this organization. Boykin is a Grand Chancellor and Joyner is the Grand Prior of the Carolinas. Both men are dominionist, Boykin: Church Called To Occupy. LTG (Ret) William G “Jerry” Boykin stated that when Jesus comes back, he will do so carrying an AR-15 assault rifle! He is a regular commentator for Fox News, and is also Vice President of the FRC. See more on – Masonry in the Church? & FanaticforJesus. – If you disbelieve anything that has been presented in this series of posts, please follow-up by doing your own research, but don’t just dismiss it as impossible or wrong. We understand how tragic is all of this and the serious threat this represents to the true church of Christ. But also will make us realize our need to pray without ceasing for the church and also for the ones harming the church. There is no doubt that a counterfeit church exist, that is being united by the ecumenical movement, & only by studying well the Word of God and by the guidance of the Holy Spirit we will be able to set them apart. Many Christians without knowing take their experiential views above the Scriptures. There is no mention in the Word of God of the superiority of our sensations, experiences or even the whisper we think is God talking to our hearts, over the authority of the Scriptures. All sensations, all insights, all “whispers in the heart” should be checked against Scripture. There is a reason why God besides sending us His Holy Spirit, also left us His Word. We can not embrace the movements of the Holy Spirit and reject the Words that He inspired. Many leaders of these movements, as an excuse for not checking on weird manifestations, say: “For the letter kills, but the Spirit gives life”. 2 Cor. 3:6. But they are using this verse out of context. It doesn’t mean to put aside Scriptures and rely on sensations or feelings. That contradicts the Bible! The verse in context is talking about the letters written on tablets of stone, the law that condemns us of sin (which waves is death Rom. 6:23), the law could not saved us only gives us a death sentence, but now we are ministers of a new covenant, not of the letter (law) but of the Spirit. I pray this information will serve as a wake-up call and help raise awareness to the dangers of seducing spirits, and unbiblical doctrines that have invaded the church; that this could also help to see the importance of studying God’s Word, and of submitting to the Holy Spirit so we can pray without ceasing to keep our hearts close to our precious Lord and Saviour Jesus Christ. Pentecost 2014 – Islamic prayer & Quran reading at Vatican, first time in History.